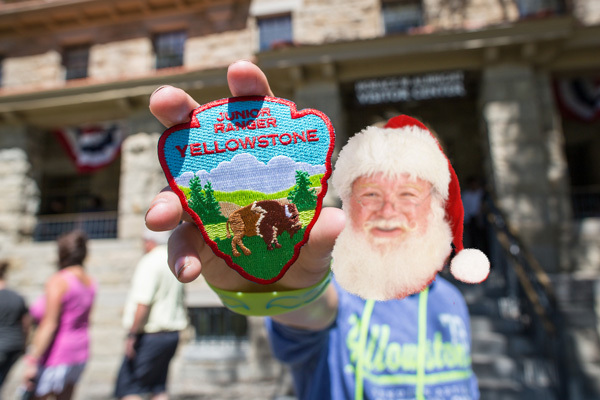 It might be time to celebrate Christmas in July but Jolly Saint Nick has been caught taking some time off this week in Yellowstone National Park! 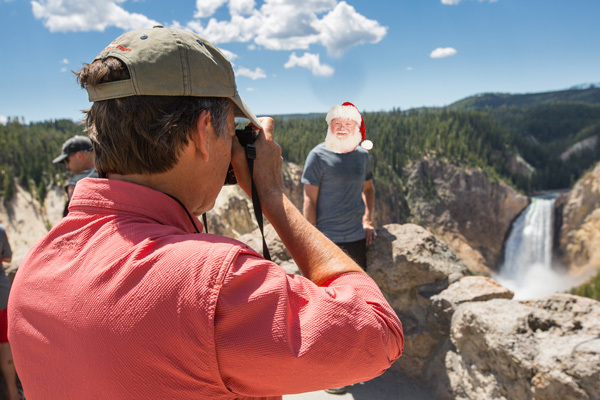 We’ve been granted exclusive access on Santa’s vacation in Yellowstone and will be posting photos regularly. Follow along this Christmas in July for some jolly good fun! July 27: S’more Yellowstone, please? 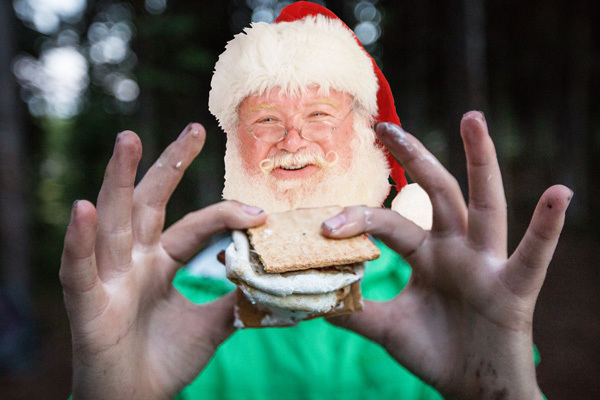 After a wonderful week of vacationing in Yellowstone, Santa’s visit ends on a sweet note with a s’more. He has a sweet tooth and he’s not afraid to admit it. After all, he’ll have to fit into his uniform come December! 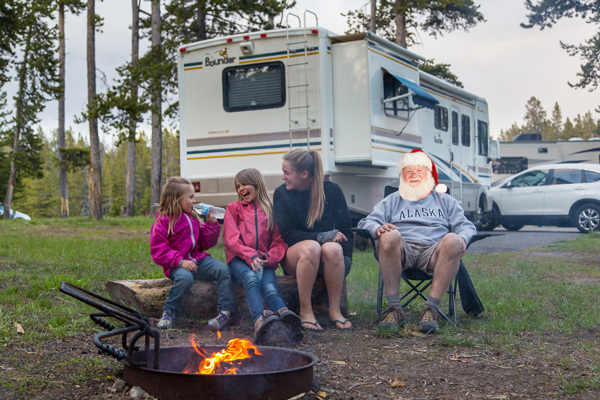 When it’s time to relax on vacation, there is nothing Santa enjoys more than gathering around a fire to tell stories with new friends while camping in the park. And Santa has A LOT of stories to tell. From red-nosed reindeers to frosty snowmen to a Grinches to an elves in New York City-Santa knows how to entertain and delight. Don’t let the white beard fool you, Santa is young at heart. To learn about the many natural wonders in the park, he signed up for the Junior Ranger program. After going to a ranger program, hiking a trail, and learning about the park in his Jr. Ranger book, he officially earned his Junior Ranger patch. He’s often found Junior Rangers to be on the nice list and now he knows why! It’s hard to travel as a celebrity. EVERYONE knows who Santa is. But Santa doesn’t mind the attention. He’s happy to pose for a photo or sign an autograph-his mission in life is to provide cheer. Here he is in front of Grand Prismatic with some fans. 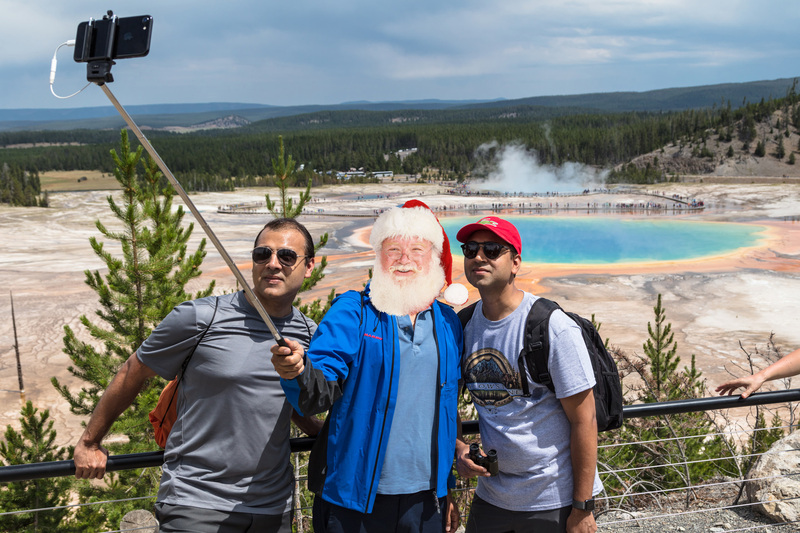 When visiting Yellowstone Santa takes the #YellowstonePledge to protect the park by staying on trails, keeping a distance from wildlife, and practicing safe selfies! Giving up his sleigh ain’t easy, but when he does, Santa likes to travel in S-T-Y-L-E and the only way to do that in Yellowstone is to hop aboard a Historic Yellow Bus tour. During his time in the park, he went on an Evening Wildlife Encounters tour where he saw all sorts of critters. His guide for the tour mentioned Santa was very engaged in the tour, he was found making a list of the wildlife he saw and checking it twice. For some people, the Grand Canyon leaves them speechless. For Santa, when he saw the awe-inspiring view he couldn’t help but let out a joyous “Ho-ho-ho.” He’s seen a lot of inspiring sites, but this one was special and filled him with enough cheer for a few years. He liked it so much he asked another visitor to take his picture and immediately updated his Facebook profile picture. There’s only one way to work off all those cookies and milk. 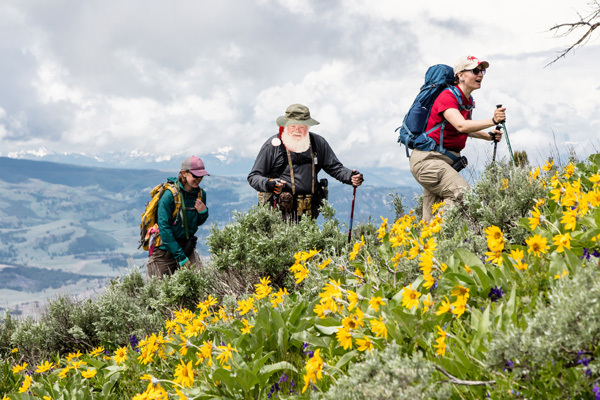 During the off season, some might be suprised to find Santa is an avid hiker. He loves hitting the trails. On his recent vacation in Yellowstone, Santa joined the Trails through Yellowstone package where he laced up his shoes to discover the off-the-beaten path side of Yellowstone. Anglers from all over the world have flocked to the park’s bountiful waters during fishing season. Nowhere else will an angler find so many public lakes, rivers and streams with such a wide variety of game fish in an area the size of Yellowstone. Turns out Santa is no different and his innate ability of seeing you when you are sleeping or awake became particularly helpful locating fish. 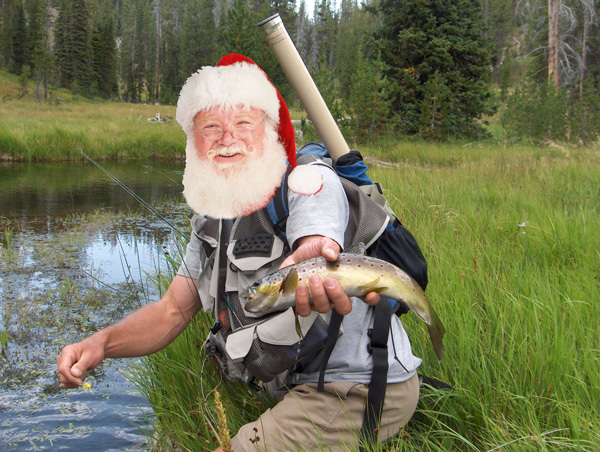 During his time fishing in the park Santa caught and released a number of beautiful fish. He also rented a boat for fishing on the beautiful Yellowstone Lake. Want to vacation like Santa? Get a good deal on amazing vacation destinations in Xanterra’s upcoming Christmas in July sale.